What did ancient Celts Look Like? Did the ancient Celts look like this? They looked like ancient Hebrews. The grave of a man dating to around 2,300 BC was discovered three miles from Stonehenge by Wessex Archaeology staff in May 2002. His grave was the richest from this period (the early Bronze Age) ever found in Britain and contained the country’s first gold objects. The Amesbury Archer apparently looks Hebrew to the artist. >What makes him look Hebrew? Process of elimination. Does he look Oriental? Does he look (North or South) American Indian? Does he look modern European Celtic? 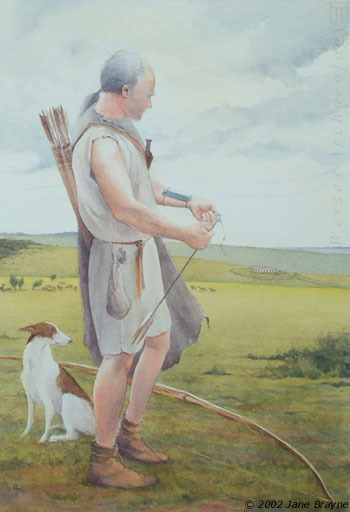 The artist has "reconstructed" and drawn The Amesbury Archer to look like a modern white Celtic man, much like any other white European/American man today. He apparently views the Amesbury Archer as a Hebrew.